This pastoral scene is created on a prepared, archival aluminum panel. This surface creates a subtle shimmer, enhanced by a thin, exposed aluminum border. The painting is mounted on a black panel and framed with a simple, black float frame, giving a more contemporary appearance. 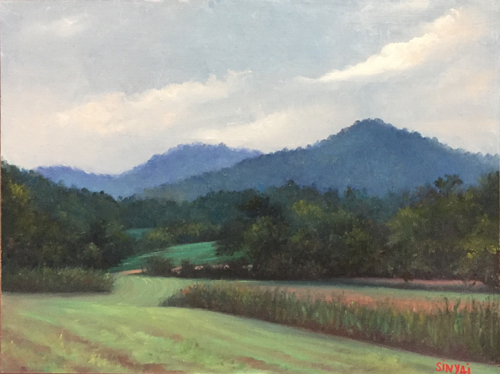 The beautiful, peaceful scene is from Leicester, NC, right outside of Asheville. This peaceful and intimate little landscape is painted on a prepared, archival aluminum panel; a surface which created a soft an subtle shimmer, enhanced by a thin, exposed border of the aluminum panel. The painting is mounted on a black panel and then framed in a simple, black float frame, giving it a sleek, contemporary look. This scene is from beautiful Leicester NC, right outside of Asheville. Oil on cradled panel. 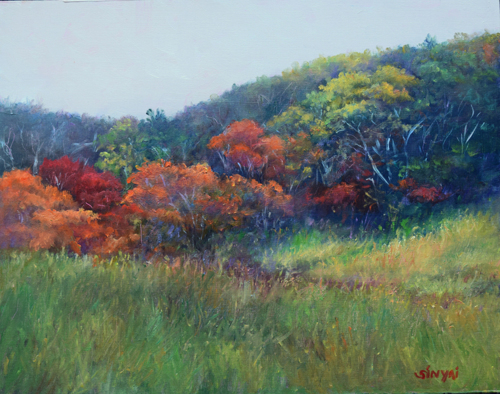 This little scene is about the way that the brilliance of vibrant fall colors is enhanced when set against a neutral grey sky. The painting is framed in a simple black float frame that allows the colors to glow. The beautiful colors were on display in Asheville, NC. This is an oil painting on a cradled panel, framed in a simple float frame. 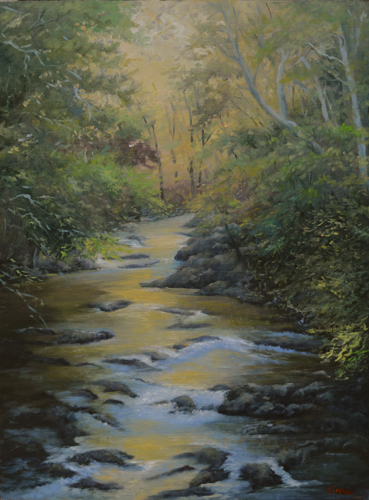 The river and surrounding forest is bathed in a golden light from the afternoon sun.